With all the planning and money that goes into having a wedding, we understand it can be hard to choose a ketubah that has both a long lasting quality style and a reasonable price. Our next award will be a favorite among those who desire a classic style and budget friendly ketubah. 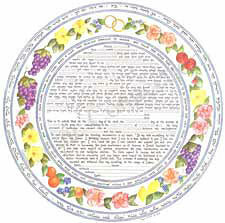 The Harvest Ketubah from Laya Crust has high quality without the steep price that goes along with it. For that, The Harvest Ketubah unquestionably wins Best Ketubah Under $50.